Located at the foot of Mt. Tapyas, Coron Soleil is the newest holiday accommodation complex in Coron Town. The 27 sophisticated, contemporary rooms is an embodiment of luxury. On my second night in my recent trip to Coron, I had a wonderful stay at this luxurious hotel. The lobby was spacious, with Filipino- inspired interiors. Wood and stone give every guest a nature-feel. Upon entering the room, my eyes were drawn to two decadent beds. After the tiring island hopping in Coron's most beautiful beaches and lagoons, my body yearns for a sound sleep. The comfy beds and the fragrant, fresh sheets are heaven! The room was spotless and immaculate- I even felt like we were the first to sleep there. This spacious room has a cable LED TV, a mini ref, a working desk, complimentary coffee and quite a number of electric sockets- perfect for bloggers like me who usually brings several gadgets to document our activities. Our room has marble bathroom with single sink and separate glass shower. The toiletries, I adore. Rooms come in these categories - Superior, Deluxe, Poolside Premiere and Poolside Suite. All are sophisticated and have contemporary interiors. Exploring the beautiful beaches of Coron provides ultimate vacation experience for sure. But it is very possible to spend your vacation in this beautiful hotel resort as well. For those who want to take time out in beach bumming and snorkeling, take refuge at the stunning pool of this hotel. Coron Soleil has a restaurant that serves international and local dishes. Walk-in guests can also enjoy its offerings. We had a gastronomic feast! 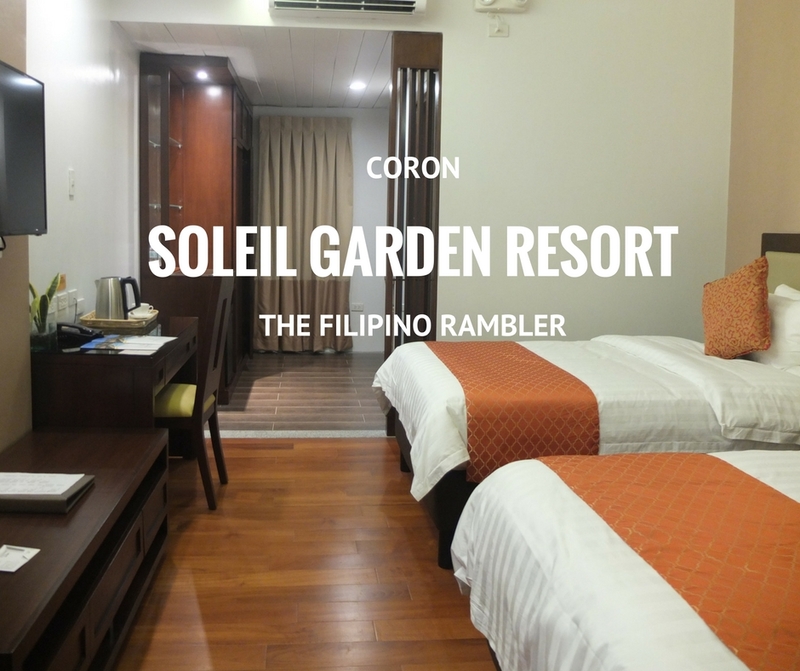 For the indulgent and luxurious traveler, Coron Soleil Garden Resort is the place to go.